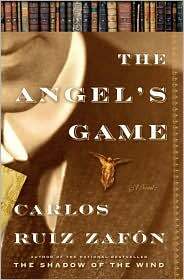 Carlos Ruiz Zafón takes a walk on the darker supernatural side in The Angel’s Game, his second installment in the Cemetery of Forgotten Books series. Zafón’s Gothic tale is actually a prequel to his successful first book in the series, The Shadow of the Wind. If you haven’t read the first book, I highly recommend you do as it is still the best in the series in this writer’s opinion. Still, The Angel’s Game is not to be missed as it returns the reader to Barcelona, Spain, this time in the 1920s, as well as the bookshop Sempere & Sons and the Cemetery of Forgotten Books. It also plunges the reader back into Zafón’s flamboyant style of storytelling with lots of dark and shadowy nights shrouded in mist. The novel is the classic “make a deal with the devil” tale where the protagonist, David Martín, accepts an offer from a mysterious publisher to write a book that will present the world with a new religion. In doing so, Martín regains his health and earns an incredible amount of money. Soon, however, Martín discovers that he is not the first person to undertake this offer, and like his most recent predecessor, he fears he is losing his mind to the endeavor. The Angel’s Game isn’t deeply theological or highly intellectual. At its heart, it’s just great storytelling. Anyone remotely familiar with the Bible will recognize the references to the angel of light (one of the Adversary’s favorite ways to deceive mankind), the 6.66 pages a day our protagonist must write to achieve his goal (does that one even need explaining? ), and the character Andreas Corelli (the name Old Nick chose to use for this sojourn among men) saying he’d been kicked out of his father’s house after a disagreement (which stands to reason when one challenges God for supremacy). However, there are some questions that arose for me while reading. One of the thoughts on my mind was whether Zafón had written himself and/or his own wishes into the story. Is he speaking through Martín when the protagonist comments on how writers sell their soul for the dream of publication? Is Zafón, a writer of successful pulp fiction like Martín, consumed with the same desire his character is to write something he believes to be more worthy? And when a peripheral character tells Martín he has seen the angel brooch Andreas Corelli wears on Martín’s own lapel, is Zafón intimating that the demons writers struggle with come from within? Another theme that Zafón floated was God as both good and evil, two halves of the same coin. I found this reinforced at the end of the book when Andreas Corelli, usually dressed in black, appears in white and offers Martín a blessing and a curse neatly packaged as one gift. But Zafón will have to forgive me if I feel no sympathy for the devil when he says, “…for once you will walk in my shoes and will feel what I feel.” Nor do I trouble myself believing the devil would ever admit he’s wrong such as Corelli did. All this led to my second thought in which I speculated that Zafón was either a disgruntled former member of a particular belief system or he had written under the impression of said belief system. Or maybe he chucked religion all together and just created an intricately woven story sure to keep the reader up all night. Whatever the case me be, The Angel’s Game is a good story. The slightly far-fetched portions are barely noticeable when the book is taken as a whole, there is a slump in pacing near the end of the book, and the ending isn’t quite as satisfying as The Shadow of the Wind, but none of these factors are enough to keep me from pressing on with the series.